Students and parents are invited to text with a current student during the days and times listed below. If you've been accepted and we have your number, we’ll text you when students in your major are available and get the conversation started. If you want to reach out to us first (or you don't get a text from us), send a question to 906-813-0569 starting at the time listed. Students are only available during the times listed below. Biochemistry & Molecular Biology Thursday, April 18 6-8 p.m.
Bioinformatics Thursday, April 18 6-8 p.m. Biological Sciences Thursday, April 18 6-8 p.m.
Geological Engineering Tuesday, April 16 7-9 p.m.
Geology Tuesday, April 16 7-9 p.m.
Health Professions Thursday, April 18 6-8 p.m. Mechanical Engineering Wednesday, April 17 6-8 p.m.
Join us for live webcasts throughout the year. We'll cover different topics including admissions, financial aid, and life on campus so you can connect with Michigan Tech from wherever you are. You’ll get the information you need in 30 minutes or less with time at the end for a live Q&A—just use the chat to send us your questions during the session and hear the answers live! Can’t make it during the scheduled time? Don’t worry—each session is recorded so you can watch it when you have time. All session times are Eastern. Links will be published on this page prior to each session. Watch recorded sessions below or contact the financial aid staff at 888-688-1885 with specific questions. Roommate Matching | Wednesday, April 24 at 5:30 p.m. If you've been accepted, congrats! Watch the recorded Next Steps After Acceptance session. If you're just starting to explore Michigan Tech, check out the recorded Get to Know Michigan Tech session. Paying for college is a big deal. Nearly 90% of Michigan Tech students receive scholarships and/or financial aid to help cover the costs of a world-class education. 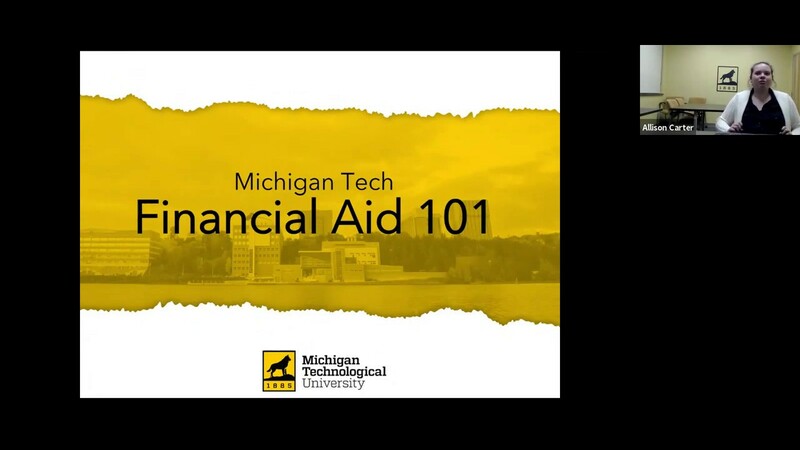 Learn more about the financial aid process, types of aid available, and important dates and deadlines. Learn why filing your Free Application for Federal Student Aid (FAFSA) by March 1 is critical to be considered for the most opportunities. EFC. COA. Awards, subsidized, and unsubsidized loans. 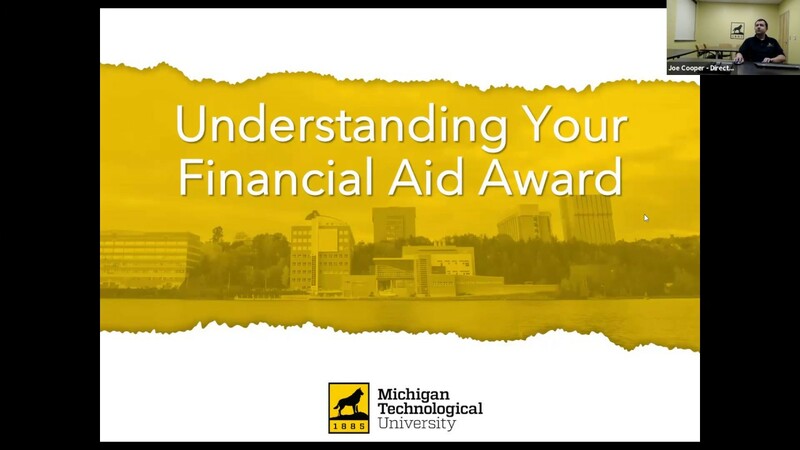 You may have some questions about your financial aid award! Joe Cooper, Director of Student Financial Services, has answers. 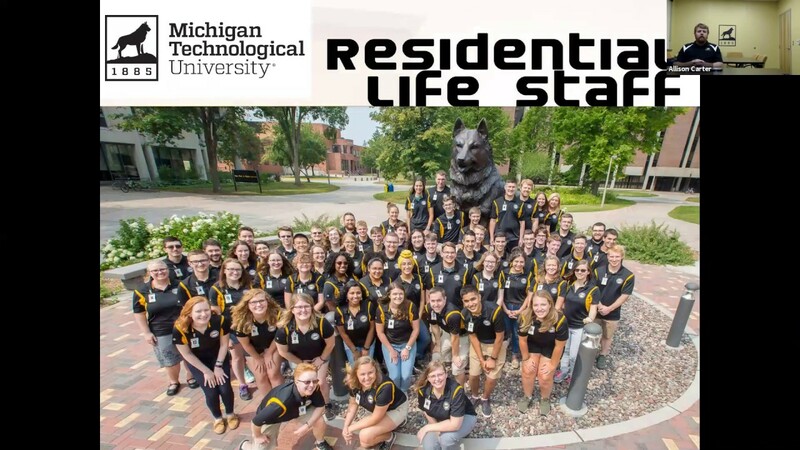 Sean Brown, Residence Life Coordinator, and Trish Bennett, Associate Director of Housing, discuss life in Michigan Tech's residence halls and answers questions through the livestream.